This is taken from the book where some of the other blogs have come from. This is the final question and answer that took place between the Ghair Muqallid and the Hanafi. have been affected by a few books. Could you perhaps do something about that? Which books have they given you? Could you show them to me? “Salatur Rasool” and “Sabeelur Rasool” both by, Hakeem Sawdiq Siyaalkoti and “Haqeeqatul-fiqh” by Yusu Jaipoori. Brother! These are the very three books which the Ghair muqalliDeen give to people in an attempt to deviate them. They move people away from following Imam Sahib (R.A), and make them follow an ignorant Siyaalkoti. What a fraud! They create a dislike towards taqleed, and put a person back onto taqleed of some modern day preacher (in another form). Is there anything wrong with the content of those books? 2) On pg.161 he states that the hands should be raised up to the shoulders or the ears and gives reference of Bukhari and Muslim, whereas these words are not found in Bukhari. 3) He has mentioned a Hadith on pg.179 under the chapter regarding masnoon Qiraat and has given the reference of Muwatta Imam Malik. This is also a lie. gives reference of Muslim, whereas this too is a lie. 5) He mentions the words ‘laa yastadir’ on pg.134 and gives the reference of Bukhari and Muslim, whereas this belies both books. 1) He narrates a Hadith thus, ‘the best of deeds is the perfoming of salah in its initial time’ and gives reference of Bukhari. This is an open lie. 2) He mentions a narration regarding three talaaq (divorce) and gives the reference of Bukhari, whereas this is not in Bukhari. 3) In a similar manner he has added the words, all of a sudden, in the translation of the Hadith regarding three talaaqs, which is either a black or white lie. Now you tell me, when Sawdiq, “truthful” speaks so much lies, what will the condition of the rest be? The lies mentioned in the book, ‘Haqeeqatul-fiqh’ are countless. Nevertheless, I will make mention of a few so that the importance of this book becomes known to you. gives the reference of Hidaayah for this. reference of Sharhe- Wiqayah for this. Hadith. He gives reference of Sharhe-Wiqayah for this. reference of Sharhe-Wiqayah for this. reference of Durre Mukhtar for this. (which tells us) not to make, is stronger. He gives reference of Hidaayah for this. reference of Sharhe-Wiqyah for this. gives reference of Hidaayah for this. muqalliDeen scholars will never ever present the original text. to bring back those whom I have made to stand with their feet spread apart in salah. The very first lesson of those friends who had put me on this (path of Ghair muqalliDeen) was, not to go and question those who have knowledge regarding the Ghair muqalliDeen, but to go to the uneducated and those who have made no research, and pester them. I have joined forces with them and ridiculed my father on numerous occasions. I will seek forgiveness from him too. Today only have I realized how these people speak lies using the name of the Quraan and Hadith. They call everything Hadith. What will the condition of the general masses amongst them be, when the ulama amongst them speak so many lies? May Allaah protect every Muslim from speaking lies and may He guide one and all to follow in the footsteps of the pious predesessors. Ameen. “Tell me, why are you called Hanafi and not Muhammedi? So, are you a Hanafi or a Muhammedi? “Today you have mimicked the wahaabis and said good-bye to your brain! “Your question is like my asking you whether it is Saturday or January; or is it Wednesday or February? Any intelligent person would be astounded, for if there were any conflict (in meaning) between January and Saturday, only then would this question be sensible. When today can be the Saturday and also be January then there is no difference between the two. Rather, the question should be, is today Saturday or Sunday? Is it the month of January or that of February? A day will oppose another day, and a month would oppose another month. I can also ask you questions like yours. Are you a ghair muqallid or a human? Are you an AhleHadith or a human? Are you Pakistani or Panjaabi? Just as these questions are incorrect in your opinion, the question of being a Muhammedi orHanafi is incorrect. Should your question be correct, would you kindly answer the above three questions of mine? The answer to such questions would just be swearing. Now listen, if someone asks as to why you are referred to as Panjaabi or Laahori and not Pakistani, you would say we are referred to as Pakistanis when compared to those living in countries outside Pakistan and as Panjaabis when compared to those living in Sindh or Baluchistan. In the same way when a non-Muslim asks who you are, you would say youre a Muslim and Muhammedi. This means that the words Muslim and Muhammedi are used when compared to non-Muslims, and Hanafi is used when compared with Shafis, Maalikis, etc. “When that which the Ummati says is contrary to that which theNabi says, then, only that which the Nabi says would be accepted. The munkireen-e-Hadith also ask if one should accept that which the Creator says or that which the creation says? The person answering will definitely say that one should accept that which the Creator says. As soon as he says this, the munkir-e-Hadith will say, Bukhari, Muslim, Abu-Dawud, Tirmizi, ibn-Majah, Nasai are all the works of the slave and the only book of the master is the Quraan, one has to accept it only and practice on it, not on the books of the slaves. The First hadith showed was that narrated by Ibn Abbas (ra), the summary of it is that During the times of Prophet (Peace be upon him), also Abu Bakr and initial period of Umar (ra)’s Caliphate 3 Divorces were considered as 1,however Umar (ra) “REVIVED” the sunnah of three divorces to be considered as three. Proof (a) The ahadith shown as arguments are Shadh and It is mistake of Tawaus who is present in all chains! Magnificent explanation in Sharh Sahih Bukhari! Saeed bin Jabeer (ra) narrates from Ibn Abbas (ra): Anyone who gives his wife three divorces then she becomes unlawful for him. Mujahid narrates that a man asked Ibn Abbas (ra): I have given my wife 100 divorces, in reply (Ibn Abbas) said: Take Three (i.e. they are applied) whereas leave the remaining ninty seven. It is also narrated by Mujahid that one man gave 100 divorces to his wife , Ibn Abbas said: You have disobeyed your Lord and your wife has gone out of wedlock as you did not fear Allah and Allah has not kept any leaveway for you in this..
Reference: Sunnan al Baihaqi al Kubra, Volume No. 7, Page No. 337. Narated By Rukanah ibn Abdu Yazid : (Rukanah) divorced his wife absolutely; so he came to the Apostle of Allah (saww). He asked (him): What did you intend? He said: A single utterance of divorce. He said: Do you swear by Allah? He replied: I swear by Allah. He said: It stands as you intended. Narated By Abdullah Ibn Ali Ibn Yazid Ibn Rukanah who said: "My grandfather, Rukanah, gave Talaaq BATTAH (emphasized Talaaq) to his wife. Then, he went into the holy court of the beloved Rasool (saww). The Holy Prophet (saww) asked him in that regard. Rukanah replied, 'I made intention of one Talaaq'. The Holy Prophet (saww) asked him, 'Do you swear by the Name of Allah that you made intention of one Talaaq?' Rukanah said, 'I swear by the Name of my Lord that I made intention of one Talaaq only'. The Holy Prophet (saww) then returned his wife to him". Fatma Bint Qais says, "My husband gave me three Talaaqs at once before he left for Yemen". The Holy Prophet (saww) legalised these as three Talaaqs. This hadith also decisively proves from the Prophet (Peace be upon him) that 3 divorces will be considered as three as clear wording of the hadith proves! If three divorces in a go had not applied on that woman then why did Prophet (Peace be upon him) get so much angry? Ghair Muqallid: What is your personal opinion regarding the mas’ala of Qiraat Khalfal Imaam (the muqtadee reciting behind the Imaam in Salaah)? Hadhrat Mufti Saheb: I will answer once you inform me which mazhab you subscribe to. Ghair Muqallid: I am an Ahle-Hadith. Hadhrat Mufti Saheb: Now you may present your question. Hadhrat Mufti Saheb: Your question is quite disturbing. Ghair Muqallid: It is strange that a mere question could disturb someone. Ghair Muqallid: And may I ask in which way did my question disturb you? Ghair Muqallid: Yes! That is exactly what I meant. Hadhrat Mufti Saheb: Al-Hamdulillah! Your inner condition reveals that you consider whatever I am going to tell you to be in accordance to that which appears in the Hadith (for this reason you have inquired from me regarding my personal opinion). Now that you have understood this, listen attentively! It is not compulsory for the muqtadi to recite behind the Imaam in Salaah. Ghair Muqallid: Will you present to me your proof for saying it is not compulsory for the muqtadi to recite behind the Imaam? Hadhrat Mufti Saheb: Once again you have disturbed me through your question. Ghair Muqalllid: How is that? Nabi (Sallallahu Alayhi Wasallam) said: It is the duty of the claimant to produce proof in substantiation of his claim. Hafiz Ibnus Salaah in his “Muqaddamah” has categorically stated that this Hadith is a mashhoor Hadith. Certainly this is not what is expected from a person who claims to be Ahle-e-Hadith (a follower of the Hadith). Nevertheless, I will still explain to you (why reciting behind the Imaam is not compulsory). To prove compulsion, one needs an absolutely authentic proof known in Shari’ah as (نص قطعى). In our case, the proof i.e. 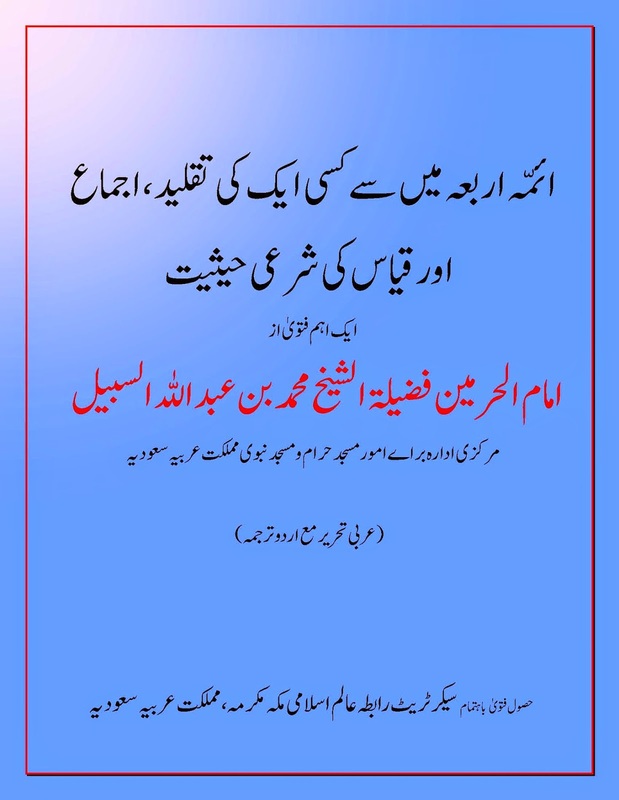 the Hadith which establishes reciting behind the Imaam is not an absolutely authentic proof (nass-e-Qati). There is no Salaah for he who did not read Surah Faatiha. Nevertheless since you have presented this Hadith, can you please explain how you have concluded from this Hadith that it is compulsory to recite behind he Imaam? From this Hadith we understand that reciting behind the Imaam was not a command of Rasulullah (Sallallahu Alayhi Wasallam). Similarly, we come to know that reciting behind the Imaam was not a common practice during the era of Rasullullah (Sallallahu Alayhi Wasallam). It is for this very reason, we do not find that the prophet (Sallallahu Alayhi Wasallam) ever questioned the Sahabah whether they recited ‘subhana rabbiyal azeem’ in ruku, ‘subhana rabbiyal a’ala’ in sajda or attihiyaat? Why didn’t Nabi (Sallallahu Alayhi Wasallam) ask regarding these aspects? This is due to the fact that this was the general practice of the Sahabah (Radiyallahu Anhum) which everyone was carrying out as per the instruction of Nabi (Sallallahu Alayhi Wasallam). Hadhrat Mufti Saheb: “Certainly! But, allow me to explain to you the correct meaning of this Hadith. On one hand Rasulullah (Sallallahu Alayhi Wasallam) prohibits reciting behind the Imaam through the following words: لا تقرءوا (do not recite behind the Imaam!) and on the other hand Rasulullah (Sallallahu Alayhi Wasallam) makes an exclusion by saying إلا (except for…). (So we have a prohibition together with an exclusion.) Thus the prohibition denotes impermissibility whilst the exclusion denotes permissibility. Definitely we understand that Rasulullah (Sallallahu Alayhi Wasallam),will not prevent you from doing a certain thing and at the same time allow you to do that very same thing. So could you explain to me which thing is Rasulullah (Sallallahu Alayhi Wasallam) preventing us from and which thing is Rasulullah (Sallallahu Alayhi Wasallam) allowing us to do. If we are being allowed to recite Surah Faatiha (behind the Imaam), then what are we being prohibited from? Ghair Muqalllid: “Everything besides Surah Faatihah will be left under the prohibition. In actual fact, what I mean is that the Hadith is stopping us from reciting anything (i.e. Surah) after Surah Faatiha like reading some other verse or like joining another Surah to Surah Faatiha. Hadhrat Mufti Saheb: “Very well. Let us make i’itibaar of this Hadith. Are you familiar with the terminology of the Muhaditheen when they mention i’itibaar? There is no Salaah for the one who does not recite Surah Faatiha and something else (over and above Surah Faatiha). There is no Salaah for the one who does not recite Surah Faatiha and whatever else you find easy to recite. There is no Salaah for the one who does not recite Surah Faatiha coupled with another Surah. There is no Salaah for the one who does not recite Surah Faatiha and two more verses. Keeping all these texts before us, we understand that it is permissible for one to recite more than Surah Faatiha. Now, you explain to me if this is the case, then what exactly are we not supposed to recite behind the Imaam? If you have any reservations regarding the authenticity of these texts, I will show it to you from the original works. Hadhrat Mufti Saheb continued: “Let us leave these questions to be answered by the learned scholars. I wish to ask you another mas’ala. Tell me, if you entered the Masjid whilst the Imaam is in ruku’, what will you do? Will you join him in ruku’ or not? And if you do join him in ruku’, then what about your Surah Faatiha? You could recite it in ruku’, but then you will be contradicting the Hadith which prohibits reciting Qur’an in ruku’ (Nasai). Now tell me, how can one call himself an Ahle-Hadith when he has ignored all these Ahaadith of Rasullullah (Sallallahu Alayhi Wasallam)? In fact (from the Ahaadith mentioned) he has not practised on a single Hadith. Ghair Muqalllid: How do I come out of this problem? I am cornered from all sides. Furthermore, understand O my son! The Hadith has prohibited us from reciting Qur’an during ruku’. Hence do not recite Surah Faatiha in the state of ruku’, for indeed it is a grave offence to contradict the Hadith. And my dear son! The Hadith says: Who joins the Imaam in ruku’, has got the rakaat. So regard that rakaat as counted and do not repeat it. Otherwise you will be committing a serious crime by ignoring the Hadith. There is no Salaah for he who does not recite Surah Faatiha. “Son! This Hadith refers to the one who is not behind an Imaam, e.g. someone who is performing Salaah alone or this Hadith refers to the Imaam himself. If the Imaam or the one performing Salaah alone does not recite Surah Faatiha, the Salaah will not be complete. After all, there must be something which the Imaam has taken responsibility of. Ghair Muqalllid: The narrator of that Hadith is a kazzaab (liar). This Hadith is a Hadith narrated by Imaam Muslim in Muslim Shareef. How dare you find fault with the narrator? Anyway, who is this narrator? Let me make a note of him. Who knows, he might appear in one of your proofs and I will use it against you. In this narration there is a kazzaab (liar). Hadhrat Mufti Saheb: Subhanallah! You mean you are actually relying upon what our Imaam Abu Hanifa said regarding a narrator of Hadith! This is fantastic. For years people have been saying Abu Hanifa does not know Hadith. Today, it pleases me to hear from your mouth that Imaam Abu Hanifa was well acquainted with Hadith. In fact, from your statement we also learn that Imaam Abu Hanifa must have written a book on Hadith in which he discussed at length the narrators of Hadith. Would you be kind enough to quote the book wherein Imaam Abu Hanifa had recorded this? There are some people (who do not follow any madhab)claim that placing the hands below the navel whilst performing the prescribed prayers is either of a weaker opinion than that of placing the hands upon the chest or has no evidence at all. This chapter will address this issue in the light of the Sunna and prove that this false claim has absolutely no foundation. According to Imam Abu Hanifa, it is part of the Sunna for a man performing the ritual prayer, salat, to place his hands beneath the navel. Many Companions of the Prophet (may Allah bless him and grant him peace) and their students (Tabi'un) performed their salat in this manner. The aforementioned scholars were outstanding in the field of Hadith sciences and clearly knew the differences between authentic, acceptable, weak and fabricated narrations. Evidence About The Validity of Placing the Hands Below The Navel During The Prayer: Hadrat Wail ibn Hajar رضی اللہ تعالٰی عنہ states: I saw the Holy Prophetصلی اللہ علیہ وسلم place his right hand over his left, below his navel, namaaz. Ibn Abi Shaiba رضی اللہ تعالٰی عنہ has narrated this Hadith with a Sahih chain (sanad). All of its narrators are credible. The aforementioned narrations prove that it is an established Sunna to place the hands beneath the navel. These ahadith are neither weak nor fabricated as Ibn Hazm would have declared them as being such because he was in strong opposition to the Hanafi School of thought. Ahadeeth of placing hands upon the chest ??? There are many other chains for this hadeeth, however, none contain this extra wording. Thus, it is clear that this is Muammal bin Ismaeel's own erroneous addition to the hadeeth. Therefore, as Imam Nimawi has concluded in his al Ta'leeq al Hasan, this hadeeth with the additional wording of' upon his chest' is extremely weak. It is an accepted principle of hadeeth that if a certain authentic and reliable narrator contradicts other equally authentic or more reliable 'arrators in his wording of a hadeeth then his narration will be declared shaadh and will not be accepted. If this is the case with authentic narrators, then an irregular addition of the words 'upon the chest' cannot be accepted from a narrator who, although declared acceptable by some, errs excessively and is weak of memory like Muammal bin Ismaeel. Hafidh Ibn Hajar has made it clear in his Fath al Bari that there is dh 'af (weakness) in Muammal bin Ismaeel's narrations from Sufyan (Fath al Bari, 9/297). The above hadeeth has this very chain of narration. Furthermore, there is another hadeeth narrated by Sayyiduna Wail (ra) himself (quoted above) which says that he saw the Prophet (sallallahu alaihi wa sallam) fasten his hands below the navel. The above hadeeth contains the words 'upon his chest'. This extra wording is not firmly established or confirmed, because of all the narrators who report this hadeeth from Simak, only one reports this extra wording. Observe the following narrations of the same hadeeth without the extra wording of 'upon his chest'. • Shareek reports from Simak from Qabeesah bin Hulb from his father who says (towards the end of a longer hadeeth), 'I saw him place one of his hands on the other and I also saw him turn once towards his right and once towards his left. '(Ahmad 21464). The above narrations all clearly show that the wording 'upon his chest' is an unreliable addition on the part of one of the reporters and therefore this particular narration is shaadh. The author of Awn al M'abud also admits that Yahya's commentary does not fit the wording of the hadeeth. This hadeeth is also mursal and although mursal narrations are not readily accepted by others, the Hanafi Ulama consider them acceptable as evidence. Therefore, as some have pointed out, this narration is binding on us. However, we say that the saheeh hadith of Sayyiduna Wail bin Hujr [radiyallahu anhu] narrated by Ibn Abi Shaibah takes precedence and the ahadeeth of Sayyidina Ali (ra) and Siyyiduna Abu Hurairah (ra) are more acceptable to us because they explicitly mention the sunnah being below the navel. Tawoos’s words “he would” cannot match the words of the companions “it is sunnah”. Also as mentioned earlier the very wording of Tawoos’s hadeeth is in dispute. Moreover, Tawoos’s mursal narration is opposed to the mursal narrations of Ibrahim al Nakhai and Abu Mijlaz. Imam Nimawi has declared the isnad of this narration to be weak. Imam Nimawi writes in Aathar al Sunan that the additional wording “above the navel” is not authentic and established. The same hadeeth has been narrated in al Safinah al Jaraidiyyah on the authority of Muslim bin Ibrahim, one of Bukhari’s shaykhs, in al Musannaf of Abu Bakr bin Abi Shaibah, [Ibn Abi Shaibah 3940 & 8722] and in Bukhari [in the chapters relating to actions in salah] in muallaq, abridged form. However, none of these narrations contain the extra wording “above the navel”. The only narrator to include this additional wording in the hadeeth is Abu Badr Shuja bin al Walid narrating from Abu Talut Abdus Salam bin Abi Hazim. Shuja’ has been considered reliable by some, but Abu Hatim says of him as quoted by Hafidh Ibn Hajar in his introduction [to Fath al Bari], and by Dhahabi in his Mizan that “He is weak in hadeeth; a shaykh who is not strong and therefore, his word cannot be acceptable in evidence, although he has saheeh ahadeeth from Muhammad bin Amr bin Alqamah.” Hafidh Ibn Hajar also says in his Taqreeb, “He is pious, sudooq and he has mistakes.” [al T’aleeq al Hasan 1/146] Furthermore, above the navel does not mean “upon the chest”. Do You Follow Muhammad (Sallallahu Alaihi Wasallam) or Imam Abu Haneefa? Raf ul Yaddain and Proves of Abrogation of Raf ul Yaddain? Reciting Surah al-Fatiha behind the Imam by Muqtadi? Wiping Hands on Face after Dua ?